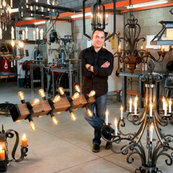 Cesar and heirloom lighting’s craftsmanship and attention to detail is nothing other than perfection! Each design and creation is unique and a piece of art. After searching for months for light fixtures for our new home online and surrounding retail stores we were introduced to Cesar by Erika M.T....interior designer. Heirloom Lighting’s production shop is just as impressive. I was honored to be able to tour his place of design and work.He creates, builds, and installs his beautiful pieces. We will recommend Heirloom Lighting to everyone who asks! Thank you Cesar!! !